In a swimming pool in Krasnoyarsk, Russia a robot prototype prepares for an arctic journey. 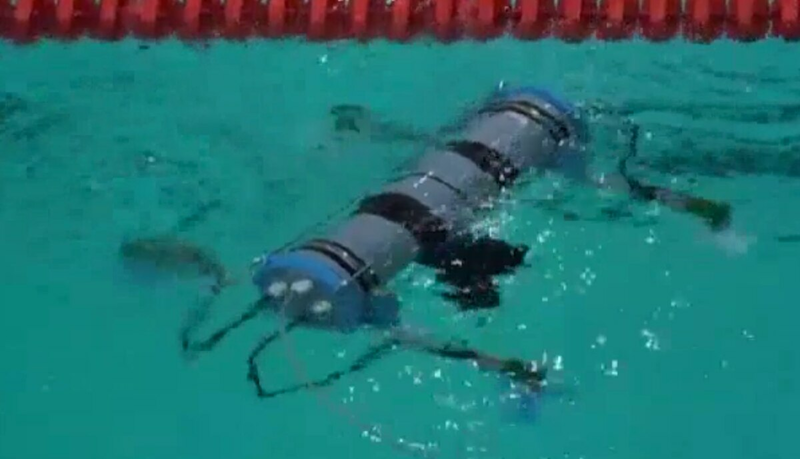 The robot is small enough, the preparations modest enough, that people swim laps as normal in the other half of the pool. This new tethered machine, with a quadcopter-inspired body, is built to scout the waters of Siberia, first for wrecks and resources, and then possibly much more. As commercial robots proliferate in air and land and sea, it’s worth looking at exactly what machines will plumb the cold depths of the warming seas. Built by the Siberian State University of Science and Technology, the robots likely first mission outside a test environment will be the bed of the Yenisei river, with a possible mission to follow in the Volga and ultimately arctic exploration in the model’s more-distant future. Russia’s robotics industry has greatly expanded its capability in recent years, and there is a somewhat fluid nature between commercially developed technologies and future military acquisitions. “This is a unique design. [We] have not seen anything similar yet, but Russian defense industry officials recently stated that there are no fewer than 17 [underwater unmanned vehicle] designs presently under development in Russia,” said Samuel Bendett, an adviser at the Center for Naval Analyses. This robot’s closest predecessor, in terms of form factor alone, may be a Belarussian anti-tank drone, which straps a set of rotors to a missile launcher used as a fuselage. But the Siberian underwater drone will instead carry a set of sensors, designed to detect obstacles, route around them, and distinguish between colors at a depth of up to 330 feet. While cold rivers will likely be the first domain of this underwater quadcopter, the robotic is explicitly designed for difficult, northern waters and climates. With these Siberian drone carrying a stated pricetag of around $2,000, getting sensitive information from under the surface is poised to be a cheap prospect.